Peabody Properties, Inc., announced that Adam Kenney and John McKee have been promoted to the position of Regional Operations Directors, effective immediately. In their new roles, Kenney and McKee will oversee Senior and Multi-site Property Managers, engage in long term capital planning, establish strategic plans for the properties in their portfolios, serve as community liaisons and continue to actively manage client services. Kenney will be responsible for managing 75 employees and 3,201 units at 42 properties throughout the Commonwealth, while McKee will manage 63 employees and 2,872 units at 29 properties throughout New England and New Jersey. Kenney began his tenure at Peabody Properties in 2004 as a Property Manager. After serving two years in this role, he was promoted to Senior Manager, overseeing multiple affordable, market rental and luxury condominium sites throughout the City of Boston. Kenney then went on to serve as Regional Property Manager, overseeing 33 employees and 600 units of housing at 29 properties, three of which feature Priority-One Homeless units designed specifically for individuals and families in need of immediate housing. McKee joined the Peabody Properties team in 2009 as a Regional Property Manager. For the past six years, he has been responsible for managing more than 50 employees at 17 properties throughout New England and New Jersey. In this position, McKee oversaw more than 1,750 units of affordable housing, including units designed specifically for veterans and formerly homeless seniors. McKee, who is interested in expanding sustainability efforts in his portfolio, has implemented energy efficient practices at a number of properties. 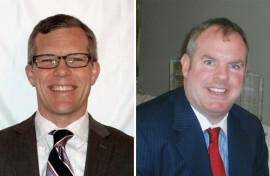 According to Peabody Properties Principal and Chief Operating Officer, Melissa Fish-Crane, the promotions of Kenney and McKee reflect the hard work and commitment exhibited by these industry veterans. “Since joining the Peabody Properties team, Adam and John have demonstrated, time and time again, their expertise in property management and their dedication to the firm,” said Fish-Crane. Kenney, who lives in Hingham, Massachusetts, received a Bachelor of the Arts degree from Providence College and a Master of Business Administration degree from the Sawyer School of Management at Suffolk University. A Reading resident, McKee received both a Bachelor of the Arts degree and a Juris Doctor degree from Boston College. McKee was also the recipient of the Regional Manager of the Year award from the Rental Housing Association (RHA) this past fall.